Palimpsest Oil 36 x 48"
Thomas Paquette is a master painter with a decades-long career of continuous exhibitions of his unique and beautiful landscape oil paintings and gouaches. He is known for painting wildernesses, having focused his attentions on nature in its pristine forms, often found in secluded preserves and national parks. 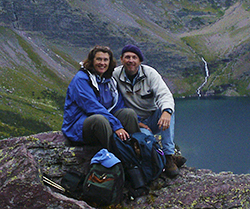 I first got to know Thomas when both he and I had artist residencies at Yosemite National Park in 1997. Since then have managed to stay in touch. Thomas had already developed a style of working oil paint which gave his landscape paintings an unmistakably unique look. Since then he has continued to add subtlety to his technique and his palette, all built on a foundation of excellence in composition and design. We spoke at length about that and the idea behind his current exhibition, America’s River Re-Explored: Paintings of the Mississippi from Source to Gulf, opening April 20, 2018, at the Minnesota Marine Art Museum, Winona, Minnesota. “It’s funny how sometimes you drop a seed one place and sprouts come up someplace else”, Thomas said in response to my question about what started this monumental art project. The genesis for the project began before the centennial celebration of the National Parks in 2016. Thomas contacted the organization in charge of the event for suggestions of some locations to paint. One of their interests was the Mississippi National River Recreation Area, a place that few artists outside the area had painted. The MNRRA stretches for 72 miles along the northern reaches of the river and includes Minneapolis and St. Paul in its boundaries. Although Thomas had lived in five different locations along the river, (Bemidji, Minneapolis, Red Wing, Winona and Edwardsville), he was neither aware of the existence of the MNRRA nor its extent. By this time, he was living in Warren, Pennsylvania, near the Allegheny River, the easternmost tributary of the Mississippi. He soon traveled west to explore the Recreation Area and began developing work for the centennial. Out of that body of work came an exhibition at the Groveland Gallery in Minneapolis in 2016. 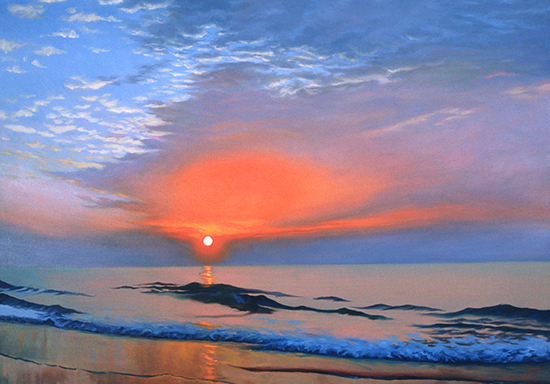 Above, Veritas Caput, Oil, 48 x 36"
While searching for additional venues to display these works, Thomas contacted the Minnesota Marine Art Museum in Winona, Minnesota. During that phone call, he suddenly hit on the idea of an exhibition of river paintings on an order of magnitude vaster in scope. On an impulse, he suggested to the curator of exhibitions, Jon Swanson, that he could produce a show not just of the little-known Recreational Area, but the entire river from the source at Lake Itasca, Minnesota, to the Gulf of Mexico, a distance of 2300 miles! The museum agreed to host the exhibition, leaving Thomas to figure out just what he had committed himself to. River Deep River Wide Oil 24 x 32"
At the time, he was unfamiliar with the lower stretches of the river and uncertain if he could find strong enough subjects for his paintings-to-be in the flatter, southern river reaches. Those concerns soon evaporated with the morning mist as he began to travel the length of the river and got to know more about it. He told me that he realized that, If anything, there is too much subject material for a single exhibition. Thus began the three-year-long odyssey along the shores of “America’s River” which culminated in this exhibition of 46 paintings in oil. Along the way he was able to add two other prestigious institutions to his exhibition schedule, the Watermark Art Center – September 7th to October 31st, 2018 and the Dubuque Museum of Art – April 27th to July 28th, 2019. Stay In Oil 30 x 40"
Thomas graciously spoke with me about his art, his artistic life, and his goals for his work in the future. This is an excerpt of the highlights from that conversation. We started off by talking about what is required of an artist, even one as accomplished and experienced as Thomas, to produce such a large body of landscape-specific work. First, of course, are the days and weeks of travel. To get an accurate picture of any landscape subject requires a significant investment of time and resources in making repeated automobile trips up and down the length of the Mississippi through all the seasons. To get an aerial perspective of the grand shape of its meandering course, Thomas also arranged for a pilot to fly him over certain parts of the river. From this research and study, he created many small to medium sized studies either in oil or gouache in preparation for his larger works. Back in his large studio in Warren, Pennsylvania, he could lay these out and work out palettes and compositions from photos, notes, sketches, and most importantly, memory. This process allowed him to carefully assess which ones had the potential to become large, studio oils. This is a critical point because the commitment of energy and time to the larger painting is a serious undertaking, and a wrong choice can disrupt the flow of work—a flow which must be maintained for several years in order to meet the goal of a large exhibition such as this. Waterway to 280 14 x 16" Oils Distant Arc 34 x 42"
That being said, Thomas told me that he welcomes the exploratory process of “finding” each painting as he works—often scraping back segments and repainting an area until it “looks right” to him. There is a certain amount of experimentation in this also, predicated on the question, “What might happen if I try this?” No matter the references for the painting, detailed or abstract, each painting gradually develops a life of its own, and must be nurtured and responded to. This is no small skill, and it takes many seasons of experience to acquire the ability to have such a dialogue with paint and canvas. And then there is the "something" which often separates the professional from the amateur—the willingness to fail and the courage to keep going. Subject to Change Study Oil on Paper 8.75 x 13"
Subject to Change Oil 24 x 40"
I found it very interesting to compare the smaller studies with the large exhibition oils. As one would expect of such exploratory work, in many cases, the smaller works are much more abstract and interpretive. Some of this has to do with the speed of execution, but is also a product of the unique surfaces Thomas creates in his paintings. This may be an inaccurate description, but I think that the small works look as though they are made up of beautifully colored applications of plaster perhaps applied with painting knives, in a mosaic-like field of colors. This is especially apparent in his skies which appear to be made up of many tiny patches of individual “sky”, each carefully, subtly, toned and shaped to fit next to the last one. Up close, the real truth of his surfaces is revealed. It helps to have a painter’s eye to understand them. While he may indeed use painting knives here and there, his bold brushwork is evident everywhere and proclaims not only the hand of the artist, but each decision made, loud and clear. Some of these decisions are absolutely thrilling in their quick, almost offhand gesture and unexpected, but perfect color. Land of Turtles Oil 30 x 20"
In the most outstanding examples of this, such as, Land of the Turtles, River Deep, River Wide, and Wandering Waters, both his colors and the shapes he creates are at the same instant natural-looking and not at all what one would expect from nature. Surprising, joyful and brilliant. Everything that art should be. Cross Traffic, Dubuque Oil 30 x 34"
”…Critics point to the inherent and unambiguous risks of nuclear power as a reason to decommission such generators. The screen of trees I painted in front of them was undoubtedly grown as a visual barrier to divert attention from the reactors. It had that effect, but not as intended. Rather, it caused me to think about the solar energy stored in the trees, with no threat of radiation”. Division of Power Oil 24 x 30"
Art historians should also be intrigued by this body of work and recognize the connections to the genealogy of American art in the twentieth, and now, the twenty-first century. Like any professional artist at the top of his field and the height of his powers, Thomas knows the history of painting inside and out. From all that, he knows where he wants to take it. I don’t think he is at all afraid to show us a “picture” of the river while simultaneously, emphatically, pointing out that this is no river at all, but only paint, intelligently, lovingly applied to a thin sheet of woven flax fibers. And that is an artistic achievement of the highest order. Morning Traffic Oil 24 x 30"
What is required of an artist, even one as accomplished and experienced as Thomas Paquette, to produce an exhibition of 46 paintings which represent his vision of the entire 2300-mile length of the Mississippi River? America’s River Re-Explored: Paintings of the Mississippi from Source to Gulf, opens April 20, 2018, at the Minnesota Marine Art Museum, Winona, Minnesota. Read our article to see what the artist has to say about the three-year-long artistic odyssey which led up to the exhibition and enjoy our showcase of 15 of his beautiful paintings.